OAKLAND, California — The little boy looked up at Portland Trail Blazers guard Damian Lillard last year and innocently questioned his affiliation to their beloved hometown park. “Are you really from Brookfield?” he asked Lillard. 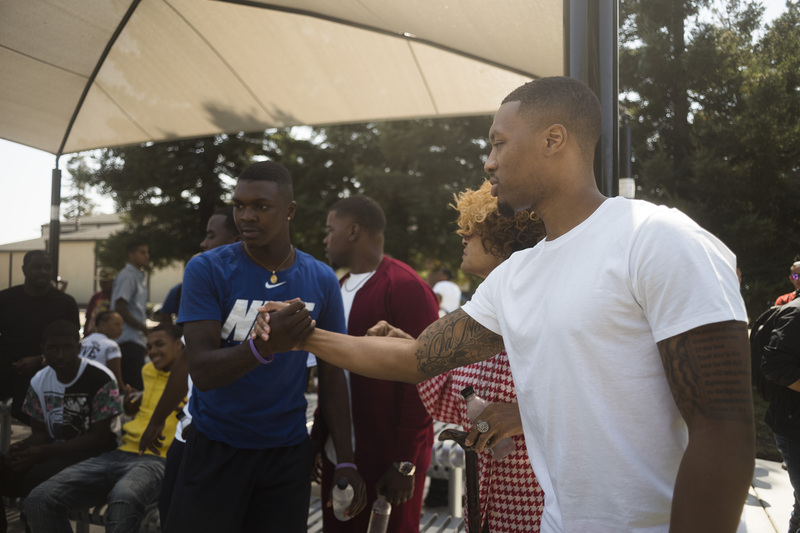 From the looks of appreciation and respect that Lillard received after his well-attended fifth annual Damian Lillard Brookfield Picnic on Sept. 9 in East Oakland, the answer was a resounding yes. “One kid, he was real young, might’ve been 7 or 8 years old, and he walked up to me, and was like, ‘Are you really from Brookfield?’ ” Lillard, 27, said Sept. 9. “And I thought about it, and I was like, well, I was in college for four years, this is my fifth year in the league … so he probably wasn’t even born when I was finishing up and coming into my own here. By the time he was old enough to understand, I was already in the NBA. So it’s kind of like, man, he really has no idea. Like, I was running around this park before you. 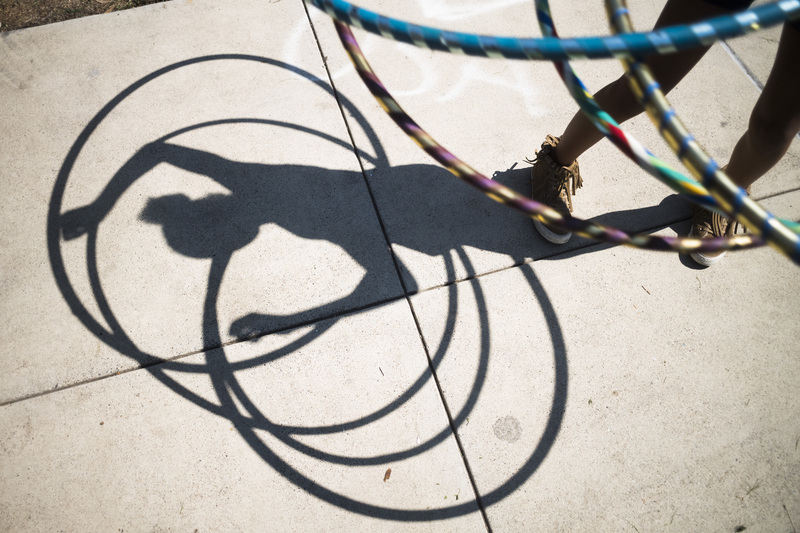 A child hula-hoops at the picnic. 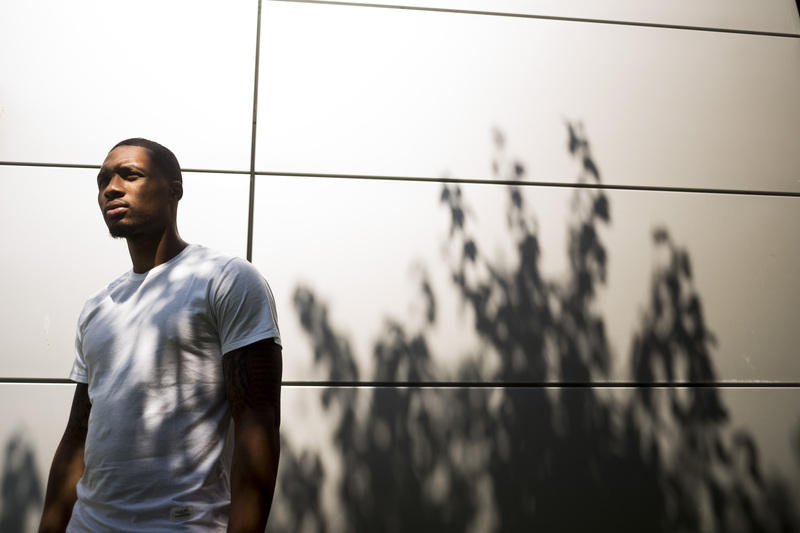 Lillard began his annual picnic at Brookfield Park to thank his neighborhood and bring them together after the local kid went from an unheralded draft pick at Weber State to the 2013 NBA Rookie of the Year. Lillard’s picnic has been a hit from the start, as he had horse rides for kids who for the most part had never ridden a horse, hamburgers and hot dogs cooked by local firefighters, a stage where Lillard rapped as his alter ego “Dame D.O.L.L.A.” with other rappers and singers, and a video game truck. Sounds of new and old-school hip-hop and R&B played from The World Famous Rick and Russ Show DJs. Lillard also gave every kid a backpack with lots of school supplies. Over the years, additions have included haircuts for boys and hairstyles for girls, a bounce house and a zip line, which Lillard enjoys taking part in. Several companies have become sponsors of the event, and shoes were given away this year. Locals were so excited for its arrival Sept. 9 that more than 100 people were in attendance before it even started. Golden State Warriors All-Star forward Draymond Green and Memphis Grizzlies rookie forward Ivan Rabb, who grew up across the street from Lillard, stopped by too. Gina Johnson, Lillard’s mother, was overwhelmed with pride when asked about the impact her son made with the picnic at a park down the street from Oracle Arena, where the Warriors play. Lillard (right) greets guests and fans at the picnic. NBA agent Aaron Goodwin, an Oakland native who represents Lillard, said his client looks forward to his annual picnic and it’s important to him that the neighborhood kids get to see him up close. Lillard makes a point to be accessible at the picnic for pictures, autographs, reminiscing with old friends and, of course, to talk hoops. Monty Gardea, executive board member of Oakland Fire Local 55, said the firefighters cooked 300 hamburgers, hot dogs and turkey burgers for the picnic attendees. Gardea said it is important for the firefighters to participate “for the community” and to support Lillard. “We like what he does for the community, giving back,” Gardea said. “And that’s what our local is all about, just giving back. We do a lot of events. This is a good one because he’s giving backpacks and he is all for education and he’s giving back to where he grew up. And that’s a great thing. 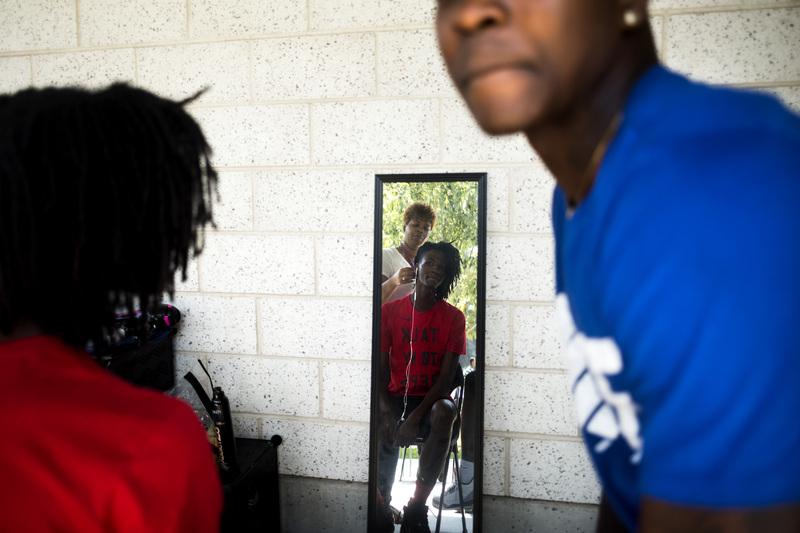 Marveunta Jones (left) gets a free haircut while his friend Tresean Jordan (right) looks on. Lillard said there was always “drama” at picnics at Brookfield when he was a kid. There have been no negative incidents through the five picnics he has hosted. There is security and Oakland police in attendance, but no one keeps the NBA star from being approached. Lillard also attended the “9-8 block party,” in his old neighborhood off 98th Avenue, a day earlier without security. Johnson said Lillard began playing organized basketball at the gym at Brookfield Park when he was 7 years old. She said he used to sneak out of their home as a teen to play in the midnight basketball league “with grown men” there too. The two-time NBA All-Star saw a lot of good and a lot of bad at the park. But the former Oakland High star also had a lot of healthy competition there that he credits for helping make him the competitor he is today. Lillard said he learned a lot growing up in his Brookfield neighborhood and what he occasionally sees now also pains him. “The good is just the toughness,” Lillard said. “I don’t just mean like physical toughness, like you’re gonna fight everybody. But, I mean like the toughness of everybody being confident. You know everybody here thinks they are the best at everything. So you’ve got to go up against that all the time, whether it’s a scuffle, or a basketball game or baseball game, or football. Everybody has that confidence that they’re the best. Just having to be tough enough to be around that and compete with that, they say it molds you to be ready for whatever, to live or go wherever. So that’s the one big positive. 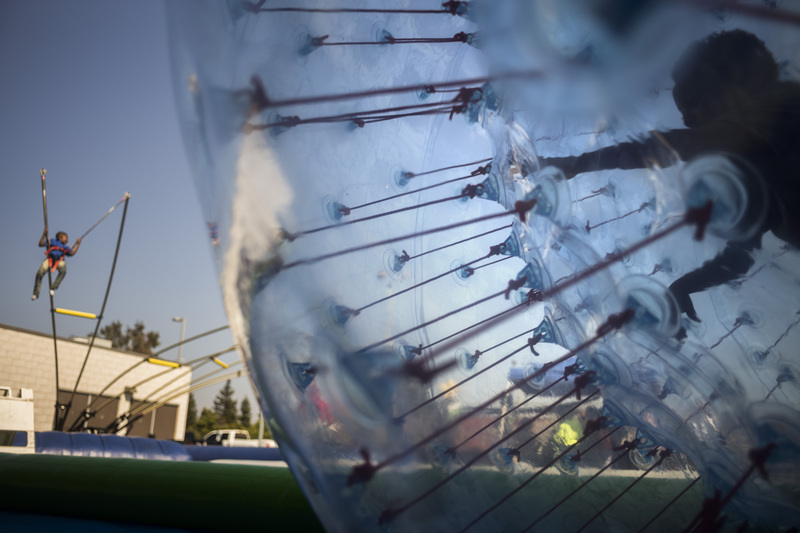 Children play with a giant inflatable ball and jump on bungees at the picnic. “The negative is just the stuff you have to experience. I got a video on my phone that I took yesterday. I was driving down the street, and there was a woman, she was strung out on drugs and she just looked bad. She was out of it, walking down the street. I was driving and I just pulled my phone out, and I videotaped it. Not to make a joke of it, but because I was just so thrown off by it. It made me realize that even though you are in the league, sometimes when you get to a certain level of success, you lose track of what your reality is, you know? And where you come from. About 40 miles south on Interstate 880 from where Lillard grew up is where former San Francisco 49ers quarterback Colin Kaepernick last played. The NFL season opened in full swing on Sunday without Kaepernick, after he was shunned as a free agent. Kaepernick received praise and ridicule for kneeling during the national anthem last season in protest primarily of police brutality toward black men. Lillard called Kaepernick’s situation “unfortunate” for him. “It’s almost like they are just telling you not to stand for what you believe in. ‘Do what we say or we got control. You won’t have a job.’ And what he wants to do as a person and who he is as a person, that’s up to him. Now, I think it says more that they’re not willing to give him a job because of what he’s doing. I think that’s the bigger problem,” Lillard said. Lillard said he never had any problems with police when growing up in Oakland. However, he did say he was racially profiled in the summer of 2011 in Elko, Nevada, when he was pulled over by highway police while driving back to Weber State for his senior year. Lillard said he bought the “Scraper” car, a modified American luxury car popular in East Oakland, that he was driving and a PlayStation for $2,000 a day earlier. “There were two African-Americans in the car, and they pulled us over,” Lillard said. “They asked to search the car, and I said no. I said, ‘I’m just going back to school. I just bought the car yesterday.’ And they said, ‘If you don’t want to let us search, we will get in contact with the judge right now and we can get a permit to search your car.’ And, I said, ‘Well, you’re not searching my car.’ So they had us pull over on the side of the road; they got the permit. “It was me and my cousin. They made us walk 50 yards up the road and just stand there. And, they searched. They took the whole car apart. Took the door apart. They took all my suitcases and put all my clothes out on the highway. And I remember three more squad cars pulled up. Damian Lillard of the Portland Trail Blazers. Lillard also talked about the upcoming NBA season. Lillard said he spoke to New York Knicks forward Carmelo Anthony about the possibility of waiving his no-trade clause to be dealt to Portland, but he doesn’t see any trade in sight. Lillard said Anthony “didn’t seem opposed” to the idea of playing for the Blazers when they spoke. The Western Conference now includes Chris Paul joining James Harden and the Houston Rockets, Paul George joining Russell Westbrook and the Oklahoma City Thunder, and Jimmy Butler joining the Minnesota Timberwolves. The reigning NBA champion Golden State Warriors and the San Antonio Spurs still are title contenders.